This week sees the launch of the new JLL VX exercise bike from JLL Fitness. It comes in three vibrant colours black, white and Pink and folds up almost like an ironing board. Before the bikes were introduced I always thought I would be more inclined to opt for a black and red design however I have to say the hot pink VX bike is quite an eye catcher. Both the white and pink bikes have a black frame so the colours on the monitor and the body of the bike really pop. The black bike has a silver frame and has a red and black monitor; the black of the body is sleek and looks very smart. Now I know what you are thinking the colour of the bike has no relevance to its power or how it operates however its physical appearance is appealing. 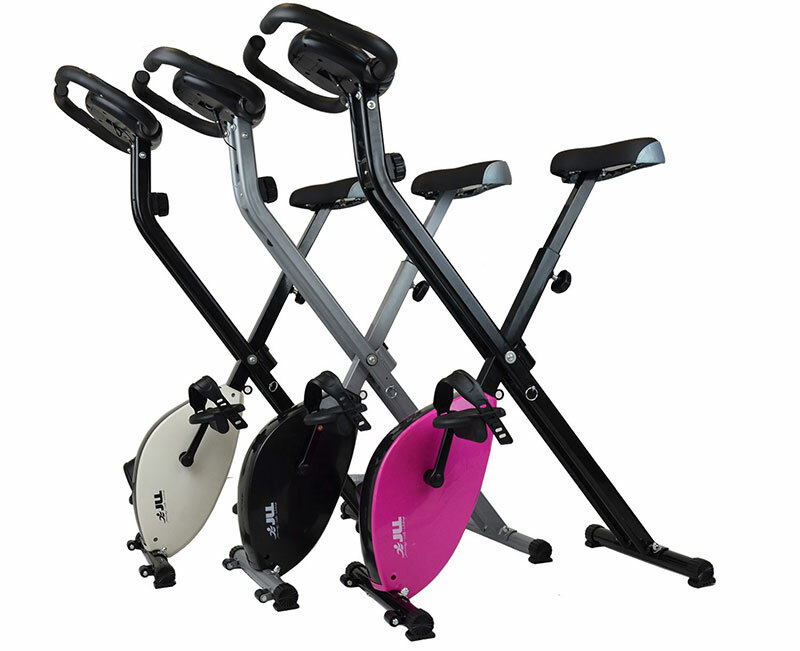 This foldable exercise bike is a powerful piece of equipment and is a great addition to any household. It has a flywheel weight of 1.5kg and 8 levels of magnetic resistance so although the bike itself is lightweight and compact it can certainly provide a challenging workout. The JLL VX bike comes with 9 levels of adjustable seat height perfect for an array of users in varying heights. The seat itself is designed to be comfortable and offers a layer of padded foam. This stationary bike also has an adjustable toe strap so you can feel secure whilst pedalling. The recommended maximum user weight for this item is 100kg. The design of the JLL VX bike is remarkable it has a 3 piece crank system on the pedals which offers durability and a smoother ride. It is foldable, compact and has small wheels inbuilt into the frame so moving it around your house is an easy task. 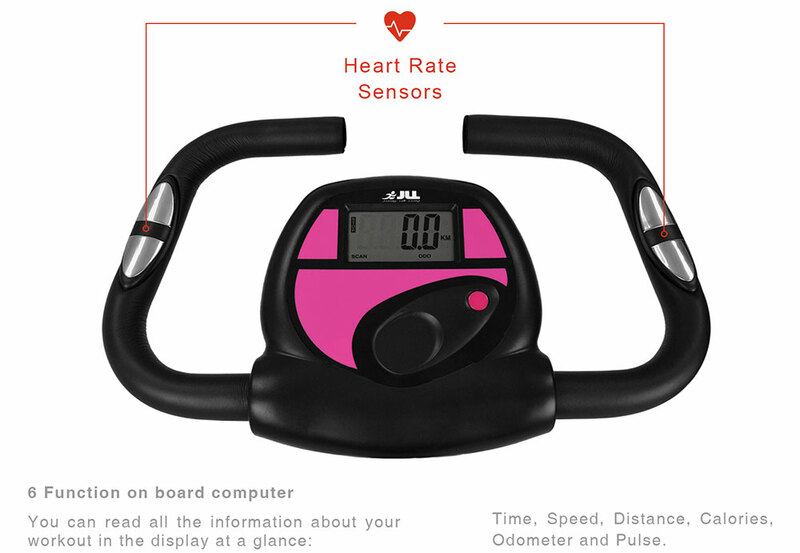 The handlebars also have a pulse rate sensor inbuilt in them and this is connected to the monitor so you can keep track of your heart rate whilst exercising. The monitor is attached to the handlebars and can show you the Time, Speed, Distance, Calories, Odometer and Pulse. There is also the added feature of the scan mode that allows you to view your stats at intervals to save you having to keep pressing the buttons on your monitor. 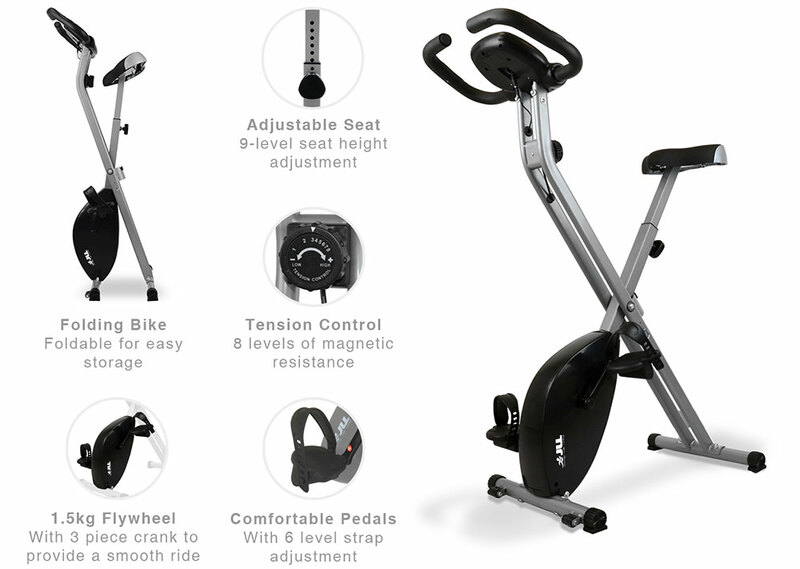 The JLL VX exercise bike has been produced using the highest quality materials and is on the market at an extremely affordable price. For £74.99 you will not only be getting a great piece of fitness equipment but you will also be improving your general fitness and wellbeing. So what does VX stand for? Versatility and variety on an exceptional piece of kit. This foldable stationary bike is the next revolution in exercise equipment.